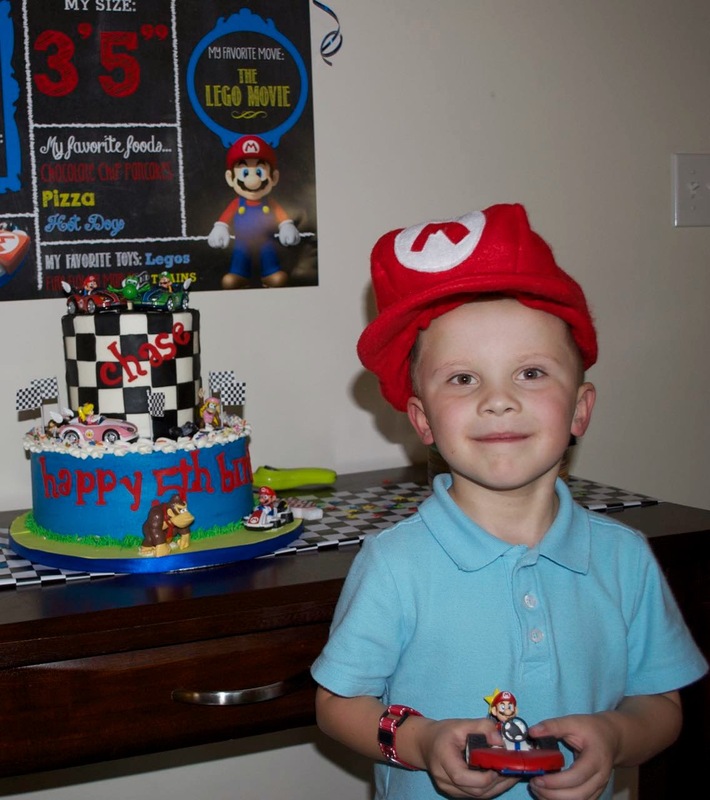 Just Another Day...: An Epic Post: Chase's 5th Birthday Party! Well, he did it! 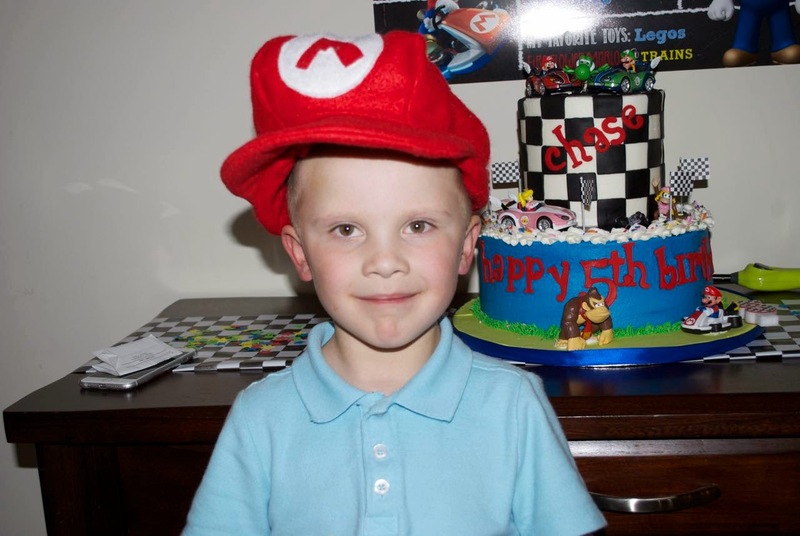 Chase turned FIVE YEARS OLD on Sunday! This was a day I could literally only hope, dream and pray for ever since we first heard that our son would be born with HALF A HEART. 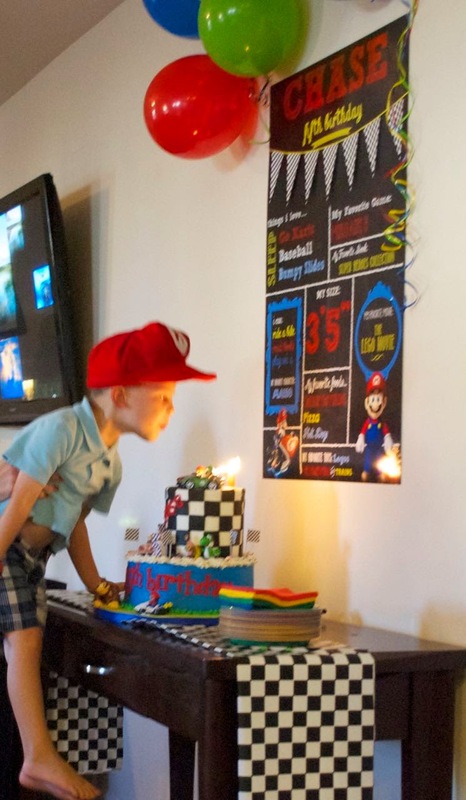 Honestly, the statistics at that time of whether or not he'd reach his 5th birthday were staggering to say the least. 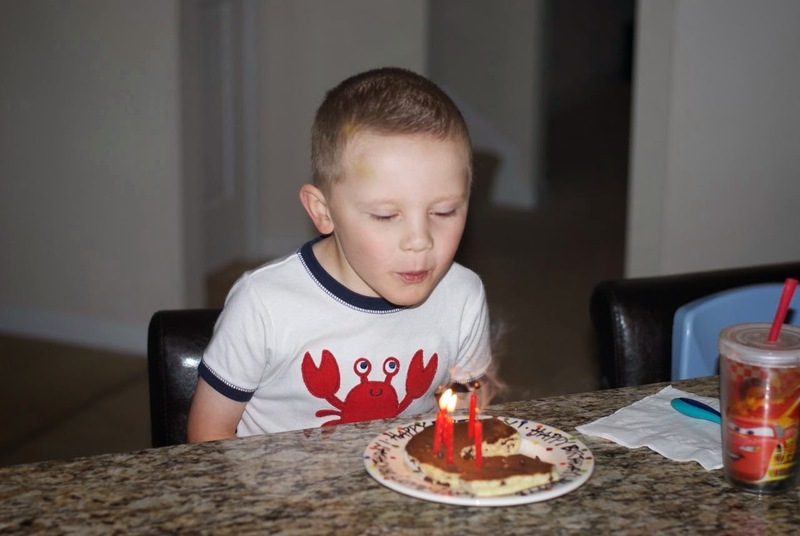 It's something I've kept with me from Day 1: my son may not live to see his 5th birthday. 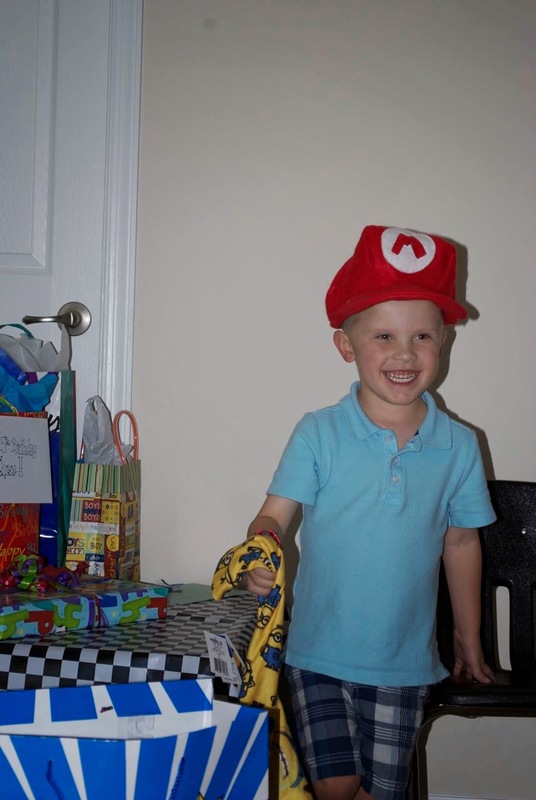 Lots of amazing, strong heart warriors just like Chase have lost their battles all too soon. I can think of so many off the top of my head that were up against the same odds as Chase but sadly were not able to keep fighting. 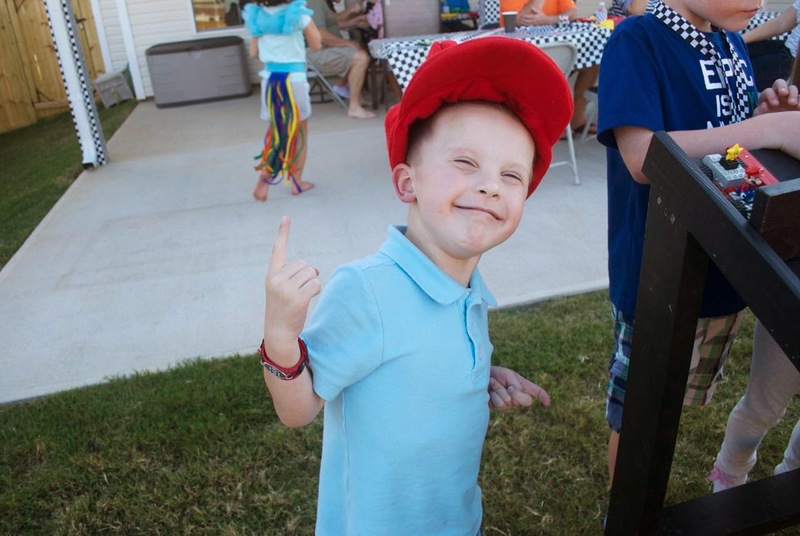 I say that we are blessed to have Chase in our lives, and that he is a living, breathing miracle right before our very eyes. And this couldn't be more true! I thank God every single day that He's chosen to give us Chase and I pray that we have a lifetime to watch him grow into the man God created him to be. So, you can imagine, how completely emotional I have been while making preparations for this party. 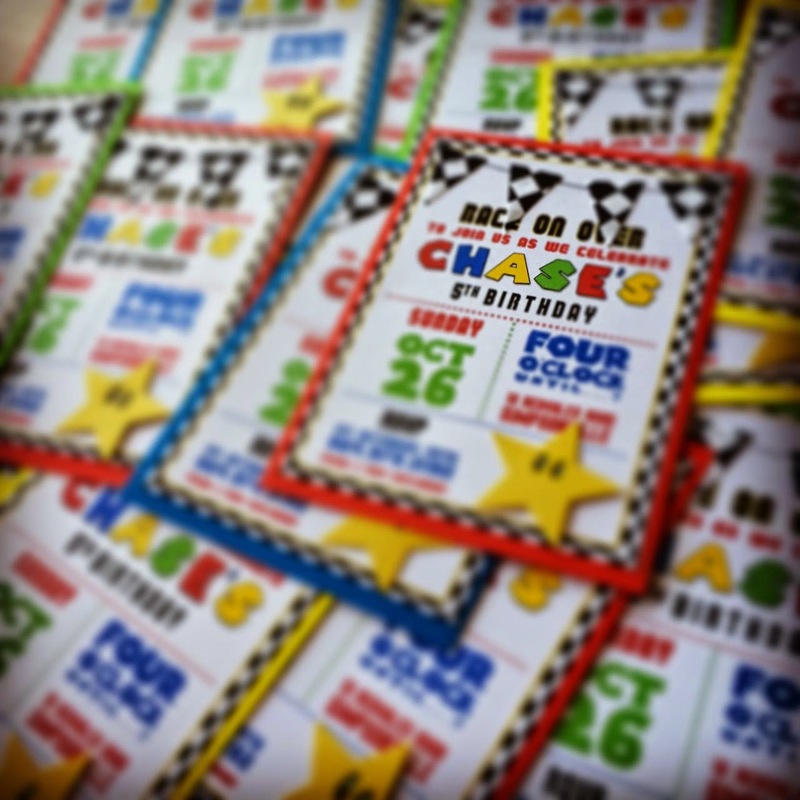 It of course is all about celebrating Chase, but for me, personally, it's also about the fact I've made it through the longest, hardest, most unimaginably difficult journey of my entire life. The ups and downs, the toll it's taken on more areas in my life than I can count, the relationships that have been lost, the fears of the unknown... so much pain that no one could adequately prepare to handle. But, BUT! It's also about celebrating those who have been with us on this journey, lifting us up in prayer, supporting us with calls, texts, meals, gifts, childcare, etc. and loving us through it all! Those who have been shoulders to cry on, sympathetic ears to listen, arms to wrap around us and carry us when we weren't able to move another step. 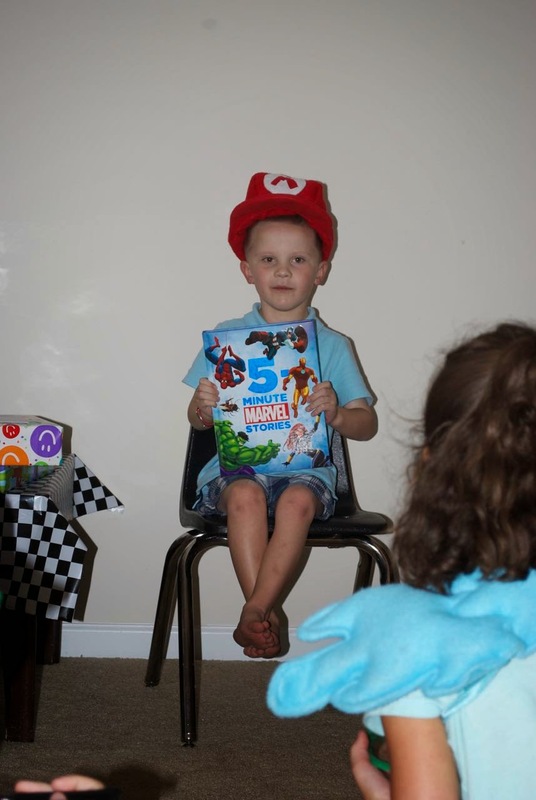 Those who interceded on our behalf and brought Chase to the feet of the Lord in prayer as he faced yet another heart surgery, heart catheterization or other painful procedure. 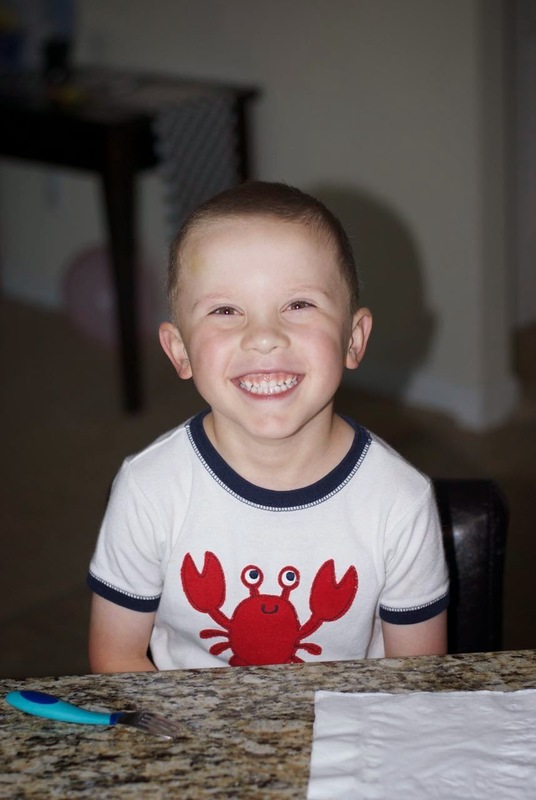 I could never find the words to express my gratitude and appreciation for the family, friends, strangers and blog readers across the world that have followed our journey with Chase. Each of you will forever be a part of our lives and the memories of our experiences through the past 5 years. Now then, without further ado, I bring you a photo-laden, excessively-detailed recap of this incredibly special day. I designed his invitation using Photoshop Elements 8 (because I'm too cheap for the full version and/or a current version). 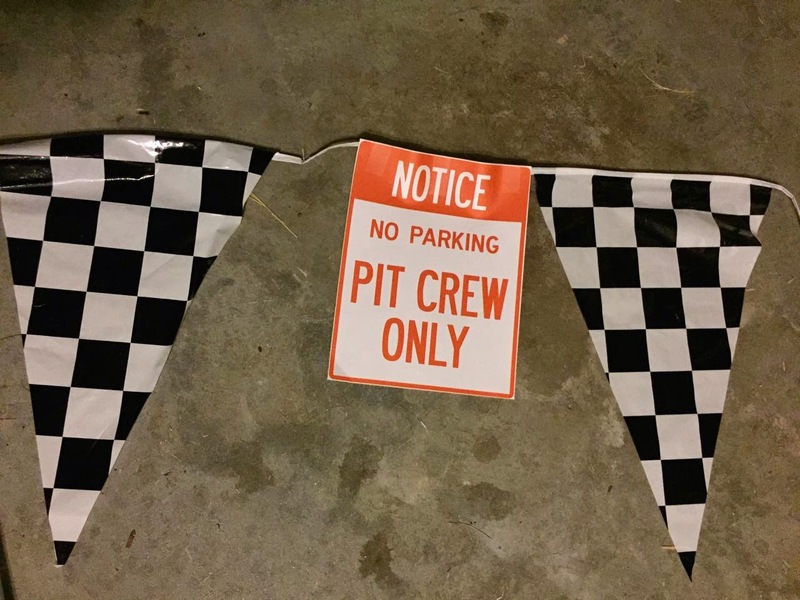 After printing them on white card stock, I then cut triangle pennant flags out of checkered fabric, and sewed them onto the card stock. 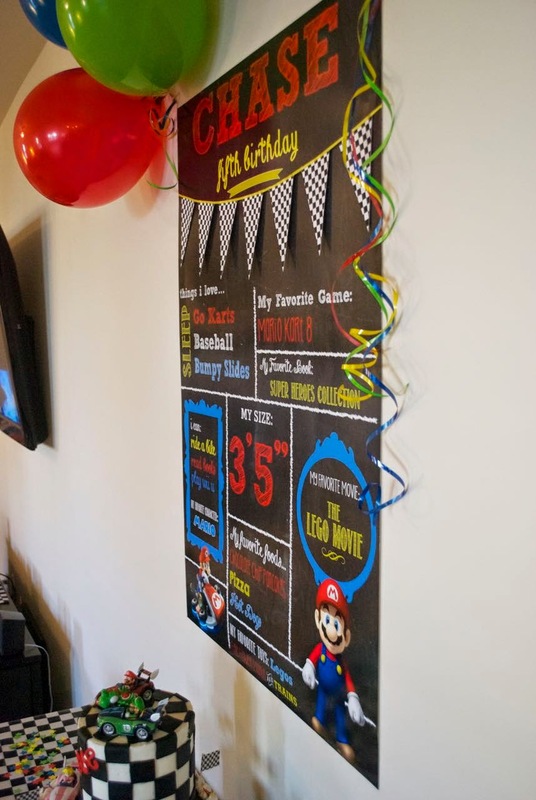 Next, I used colored card stock that matched the party theme (red, yellow, green & blue), and attached the invitation to it. Finally, used a large star-shaped punch to create super stars, gave them eyes, and then used hot glue to attach them to the invitation (I wanted them slightly raised off the paper to add dimension). I LOVE LOVE LOVE the way they turned out! 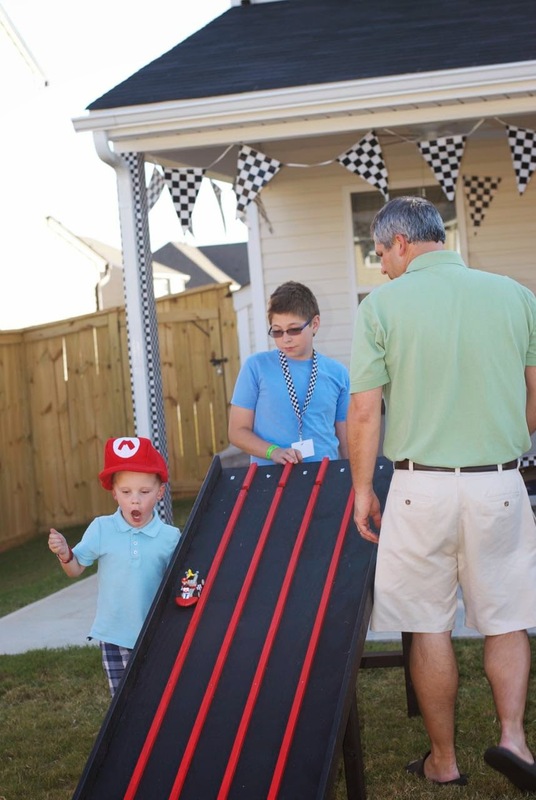 LOTS and LOTS of planning went into this party. 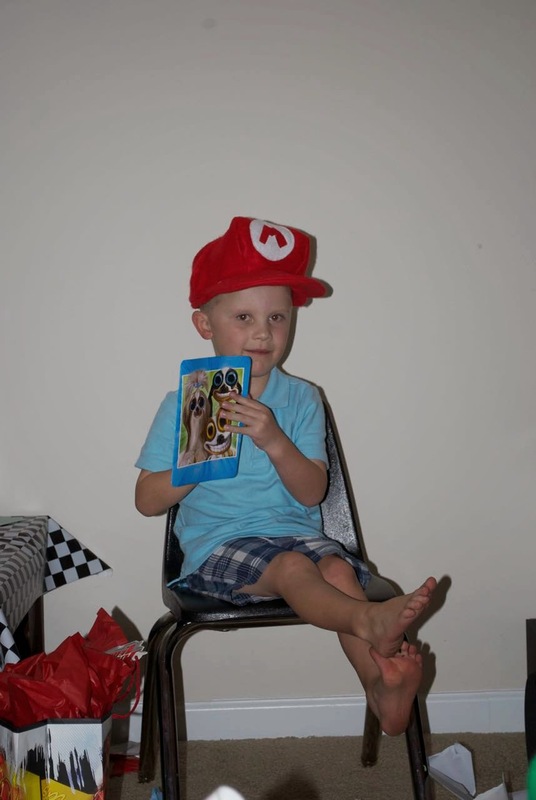 Of course everyone knows the kid would've been happy with a toy car, an empty box and some cheese puffs, but that just didn't seem "party" enough to me. LOL! 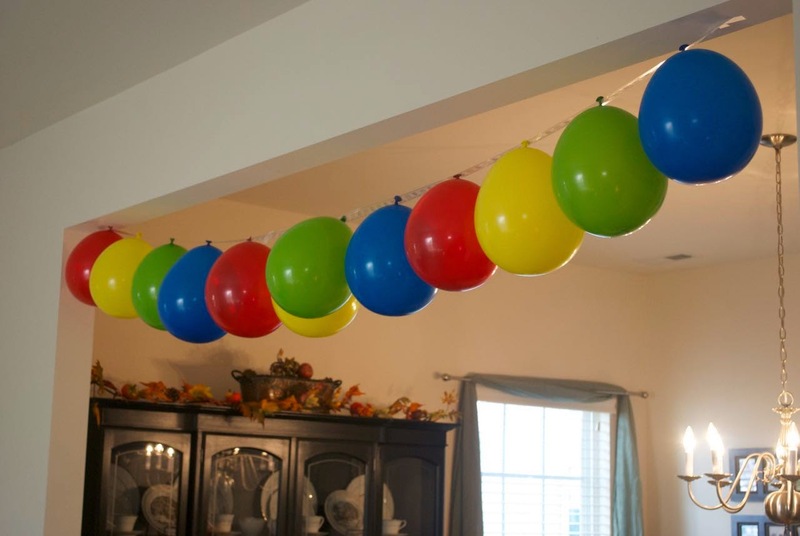 So I cannot tell you how many hours I spent making cute and fun things to add a special touch to the party. I really love doing those things, but I think I bit off a bit much considering I'm also homeschooling and keeping up with all of the regular demands of life. Whew! But enough venting... let's continue! And this girl? Whoa. 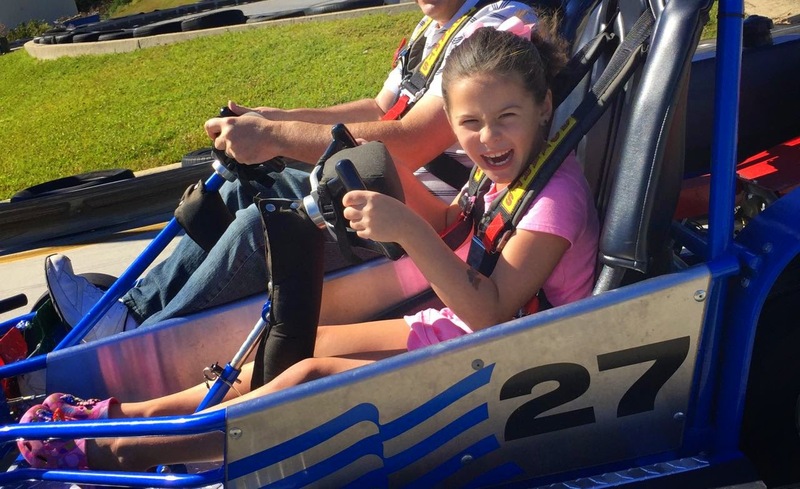 She loves her some go-kart fun, too! Check out that face!!! Love. 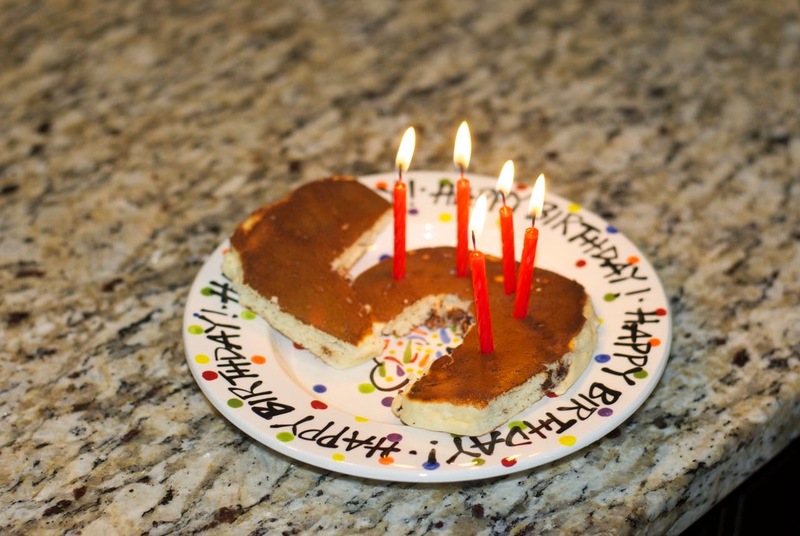 Then, on his big day, we of course began with birthday pancakes -- and they were his favorite: chocolate chip!! He patiently waited for his pancakes... perhaps a wee bit excited about all the day had in store for him. I could just eat up that smile! After pancakes, it was time for church! Then home for lunch, a quick nap (giving us adequate time for our last-minute preparations), then... PARTY TIME! 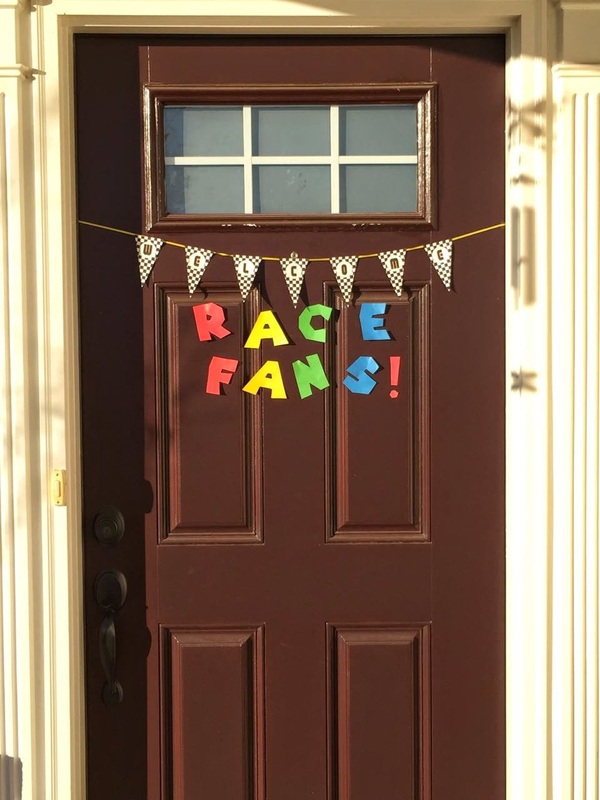 We invited our guests inside with a sign on our front door made from racing pennant flags I had printed along with cutout letters in a Super Mario font that read, "Welcome Race Fans!" 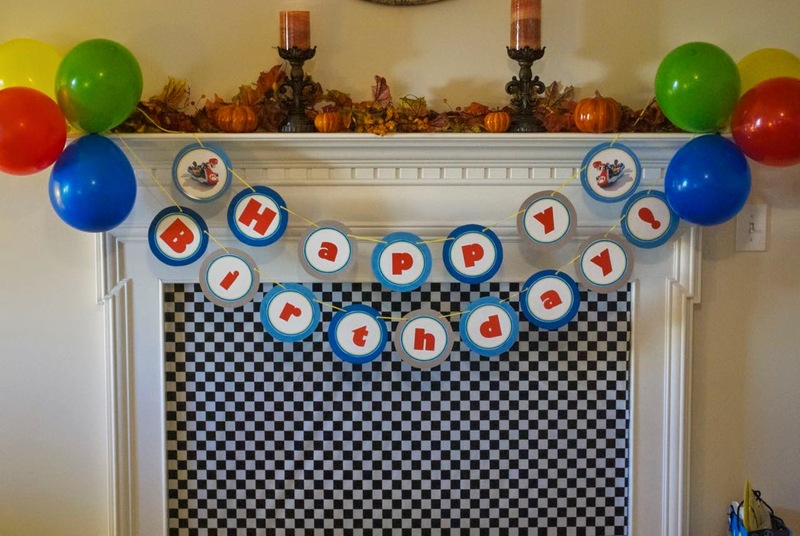 Inside, the decor was a bit minimal, with the exception of several balloons and lots of checkered racing print! The party was on the first floor of our home, and I wanted to ensure we didn't have any wanderers getting lost upstairs. 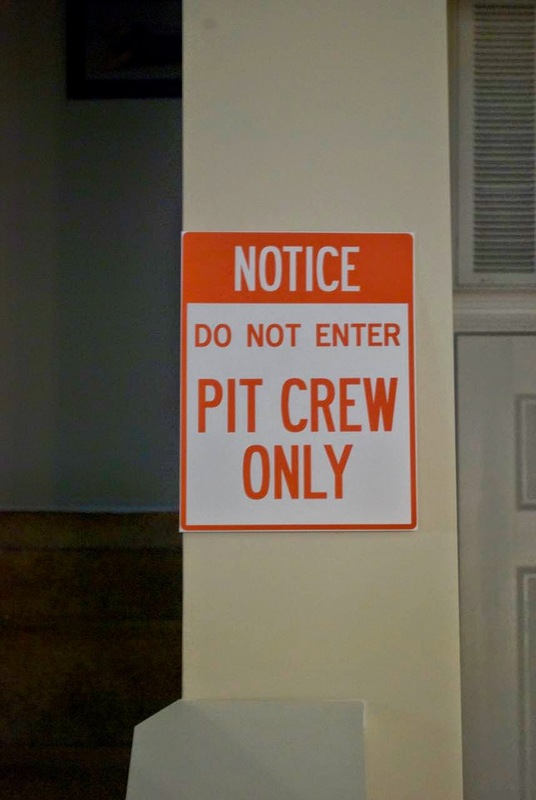 So between the baby gate at the bottom of the stairs (this was legit -- we had two littles at the party we didn't want navigating stairs) and the sign I posted, we were able to successfully keep the party in its designated area. 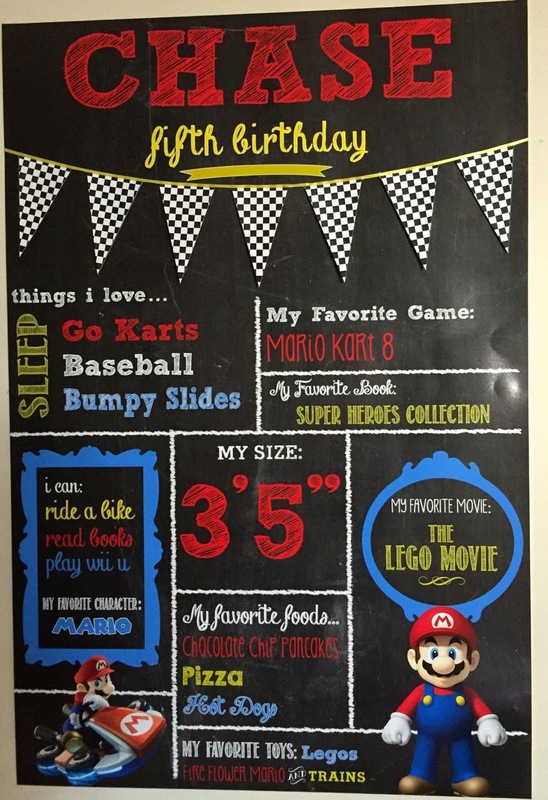 One of my favorite features of the decor was a 24"x36" "chalkboard" print I created in PS Elements listing lots of facts about Chase. I found the idea online but definitely made it my own. It was fun interviewing Chase for this project! I had no idea he loved SLEEP. What 5-year-old loves to sleep? And I had no idea his favorite movie was The Lego Movie as he had only seen it one time in the theatre. But this was such a fun way to learn more about him, and I'm sure I'll want to do something similar for E and LO's next birthdays as well. 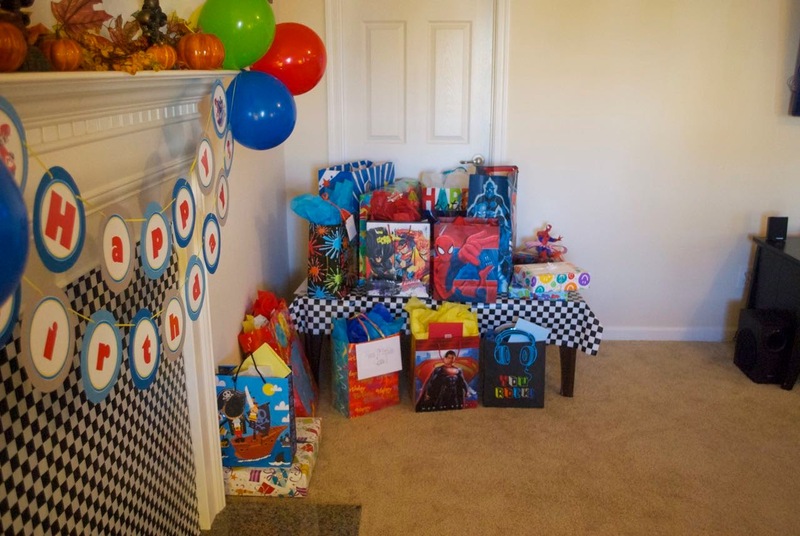 I set up a gift table in the corner of the room, covered with the checkered print. 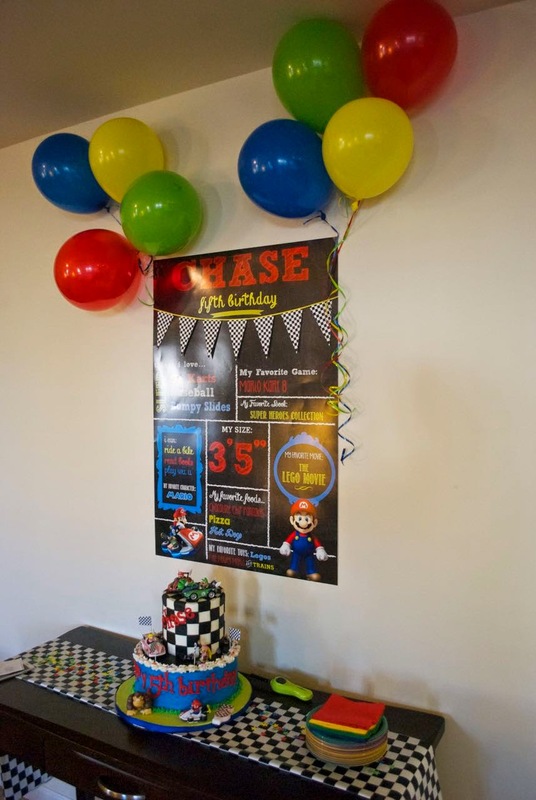 The birthday banner I made for him 3 years ago was over the fireplace, with updated images of Mario Kart to keep it tied into the theme. 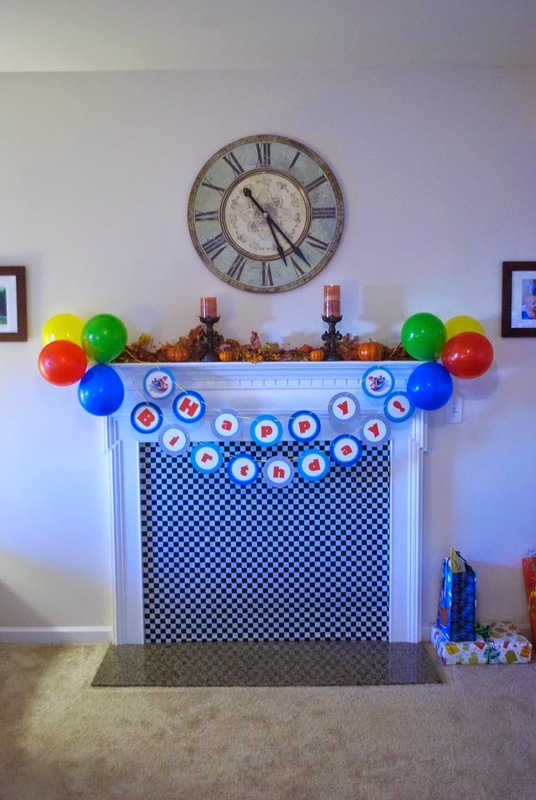 A few balloons and some more checkered print over the fireplace, and voila! Done. 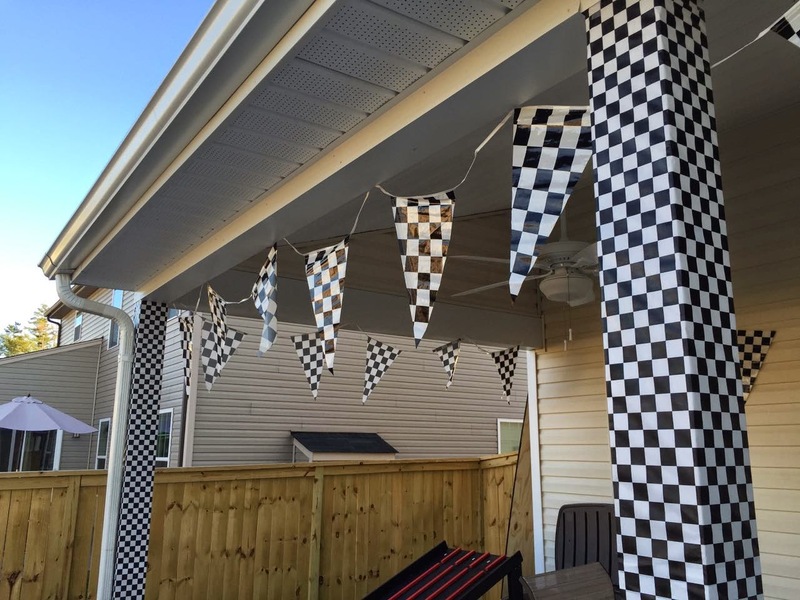 Outside we did LOTS of checkered print decorations. I mean, LOTS. 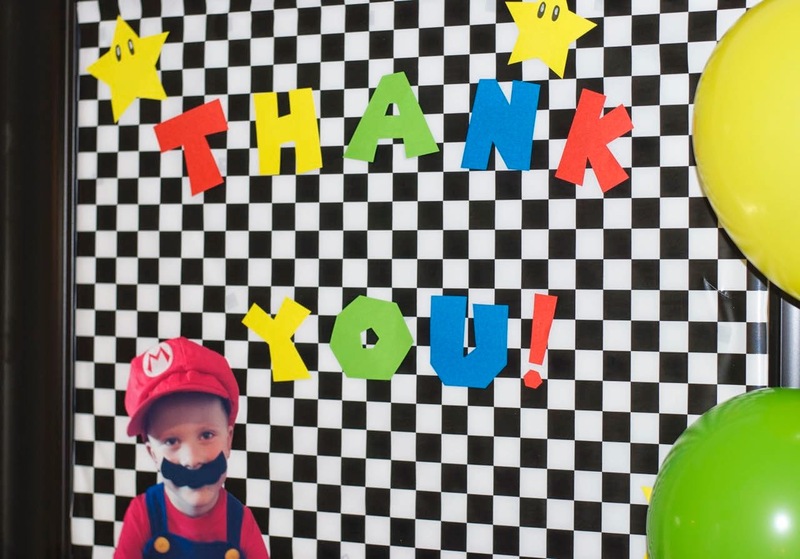 Like, as in, hopefully the party guests weren't dizzy from the sheer volume of black and white checkered surfaces everywhere. 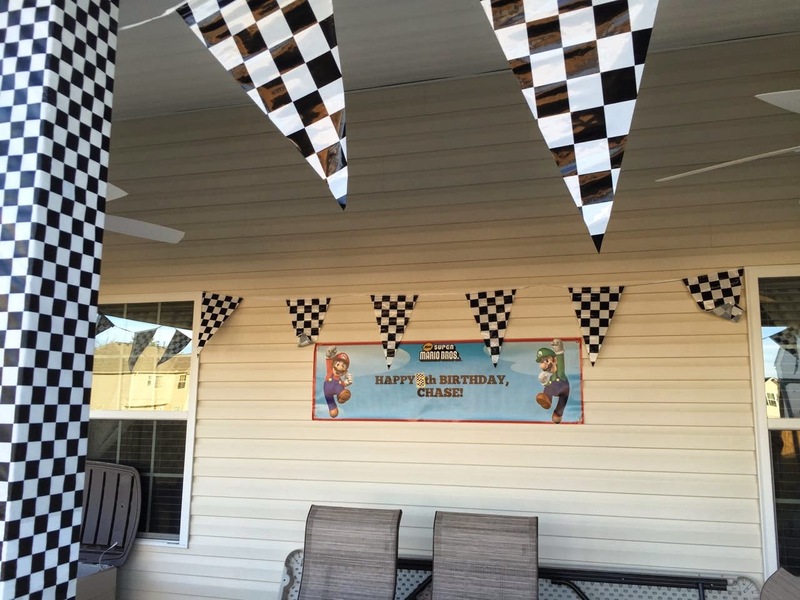 We covered the posts in the backyard (as well as the column on the front porch) and hung 2' plastic pennant flags. 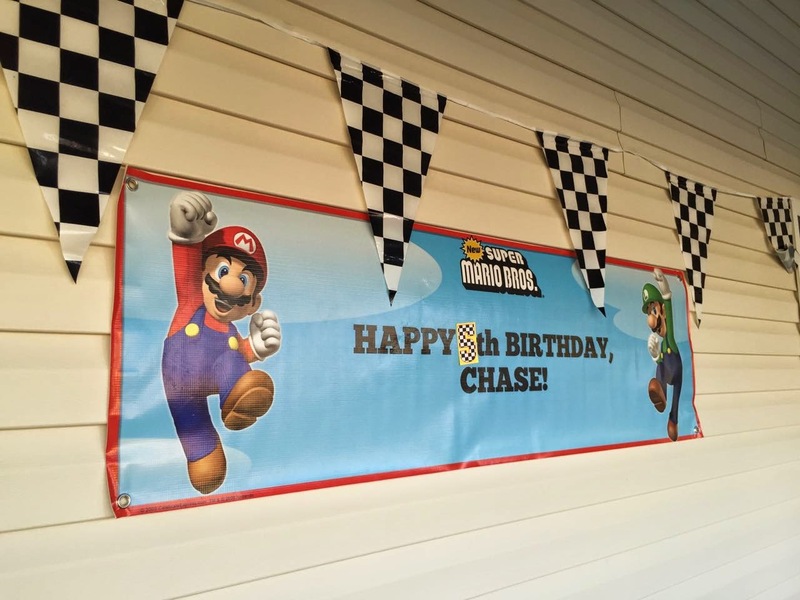 Outside, I reused his birthday banner from last year's Super Mario Bros. party with an updated "5" for this year. In the front yard, we staked off the driveway and hung the plastic pennant flags because we knew we'd need the driveway clear for a certain little gift later in the evening. I added a little sign to keep with our theme. And I don't think this was too much of an inconvenience for our guests considering there's a ginormous parking lot literally across the street from our house. So convenient! The last thing our guests would see as they were leaving after the party was the "Thank You" table I had set up with a couple of party favors. I covered the mirror at our entryway with my beloved checkered print and cut out the letters and stars. 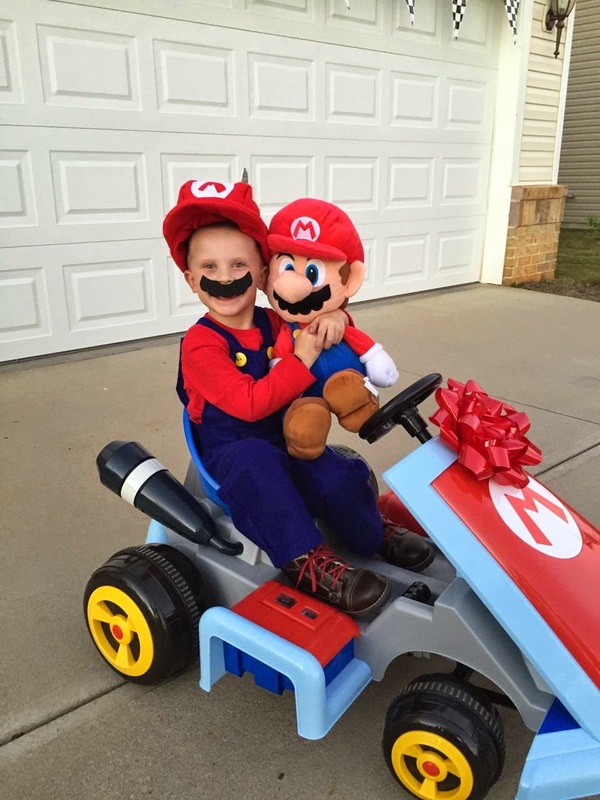 Then I took a goofy pic of Chase in this year's Halloween costume (spoiler alert: it's Mario, again) and added it to the sign. Cuteness! 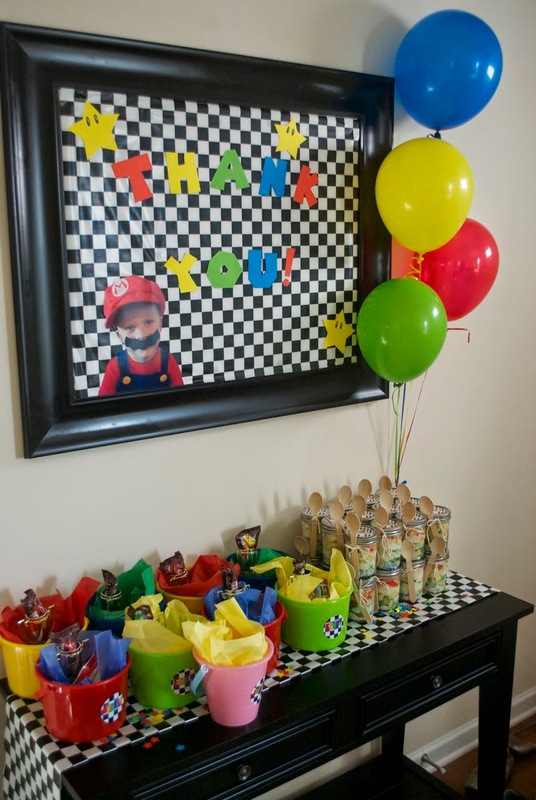 For the kids, I wanted to make party favors that could be incorporated into the party. Or maybe, I actually wanted items used at the party to also be party favors. Ya, that last one sounds about right. 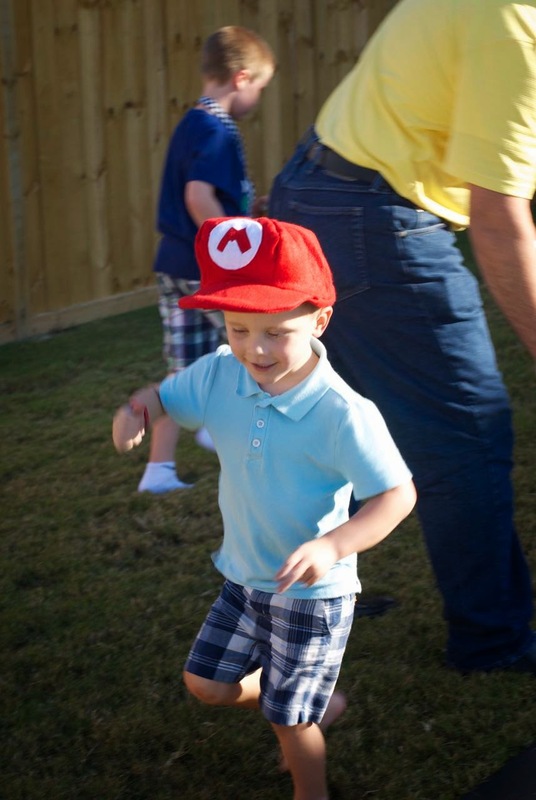 So for starters, I decided to make Mario-themed hats for all of the children. 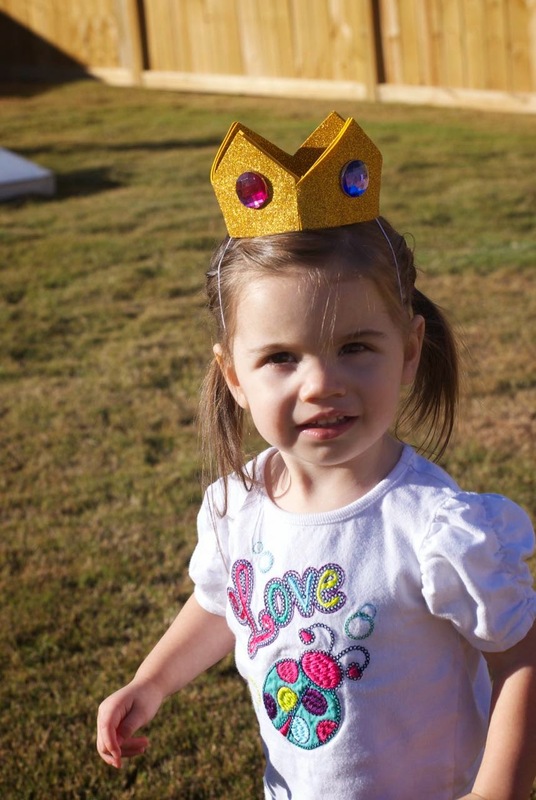 The girls all had their very own Princess Peach crown. See one modeled on my adorable little niece below. 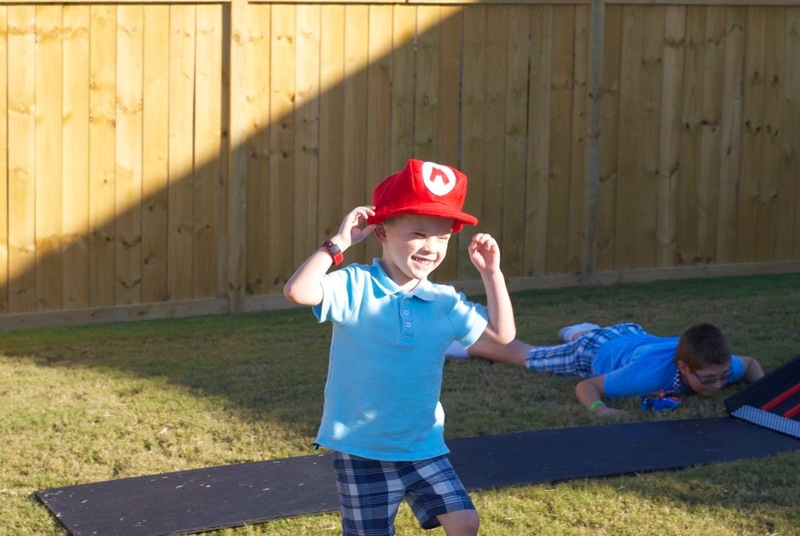 I didn't get a photo of the hats all set out on the table before the party, but here are some of the boys wearing the Mario and Luigi hats I sewed. I'll be honest -- these things were a bit more of a task than I had expected them to be, but I'm glad I did it, even if they didn't come out exactly as I had envisioned. My next sewing project involved lanyards I made from a checkered print fabric I found at JoAnn's. Then I added swivel clips from Amazon to complete the lanyard. 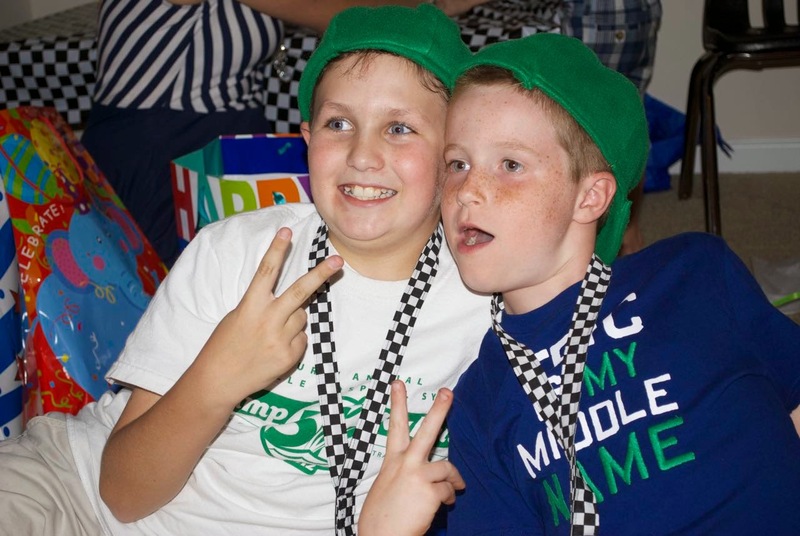 I didn't get pics of them before the party, but you can see them modeled on these two crazies here!! LOL! What were the lanyards for? Good question! 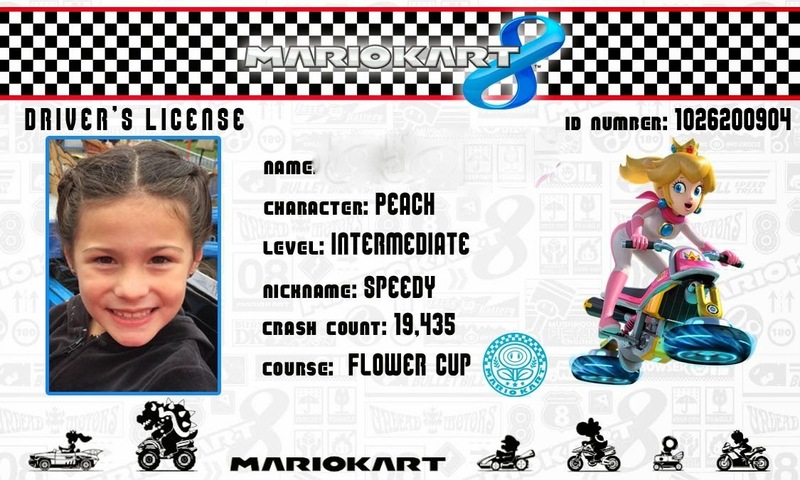 I made Mario Kart 8 driver's licenses for each of the kids. I included their name, a character, and made up a "level" and a nickname for each of them. I also made up a "crash count" -- as if it's possible to track the number of crashes when playing Mario Kart! Ha! Chase, a.k.a. 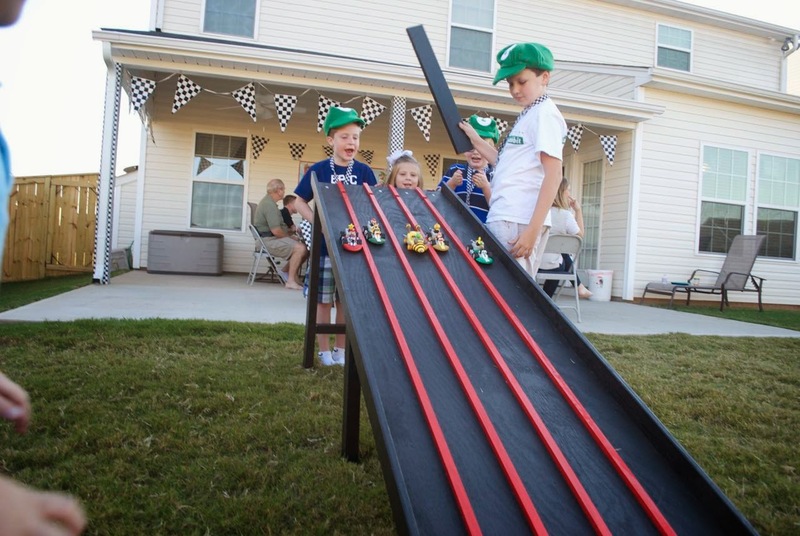 "The Dominator," was the only Expert driver at the party, and had the least number of crashes. I figured it was his big day, so I ought to make him extra awesome! LO, a.k.a. 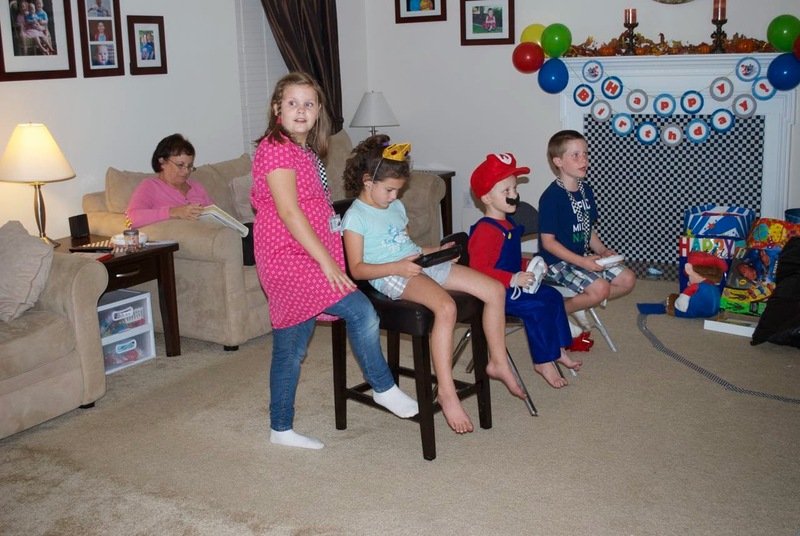 "Speedy," was an Intermediate level because, let's face it, she's always asking Chase how he did something when they're playing Wii U. Chase is the king of the Wii U in our house. So much mad skill for such a young gamer! I couldn't leave out the little kiddos. 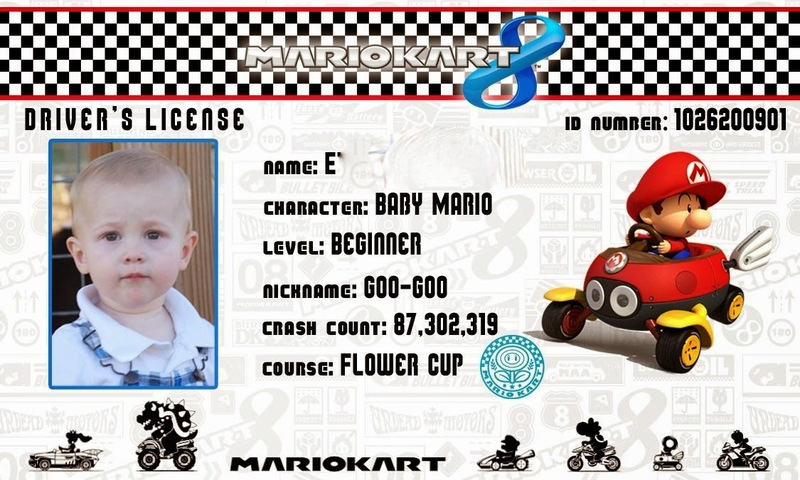 E had his very own license, too, although I didn't allow him behind the wheel. Um, except that one time... And yes, my kids call him "Goo-Goo" or "Goo-Goo Face" or "Goo-Goo Pants" or some other variable containing "Goo-Goo" so that's where his nickname came from. Notice anything special about the driver's license ID numbers? Those first 8 digits are pretty meaningful to our celebration. The last two were just added on to help me keep track of this party favor project. I also made party favors for the adults to take home -- I'd hate for anyone to leave one of our parties empty-handed! 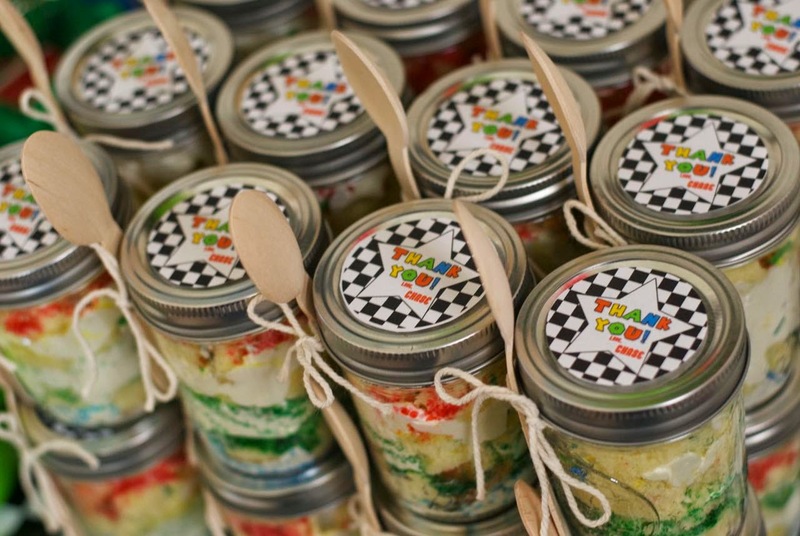 So I purchased half-pint Ball glass jars and filled them with cake and frosting! 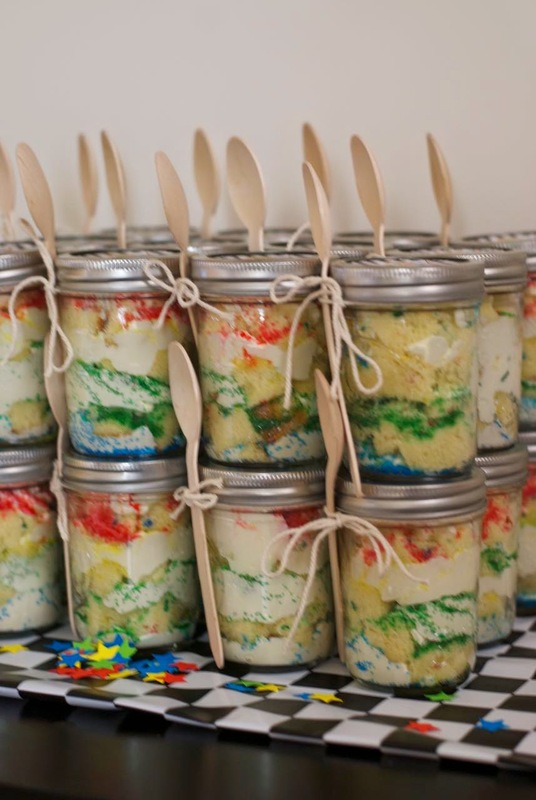 I used Duff Goldman's Confetti Cake in a Jar video for these. He made his confetti cake and a swiss meringue buttercream frosting. I hear these were delish, but I never actually tried one myself. I added wooden spoons from Amazon and a label on the top that said, "Thank You! Love, Chase." For dinner, Chase made it super simple for us by requesting his favorite -- Papa John's pizza, which I served alongside a large salad. 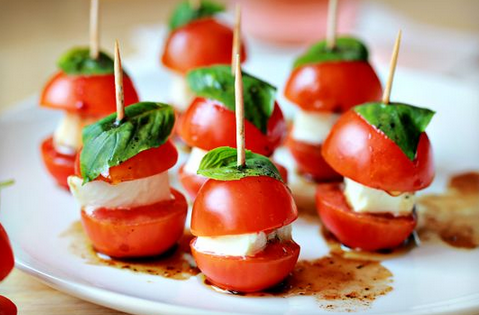 We were happy to oblige and appreciated the simplicity of it all! The guests didn't seem to mind terribly, even though I was wishing I had a different menu to offer rather than pizza. But it was the birthday boy's big day, so I had to run with his wishes. 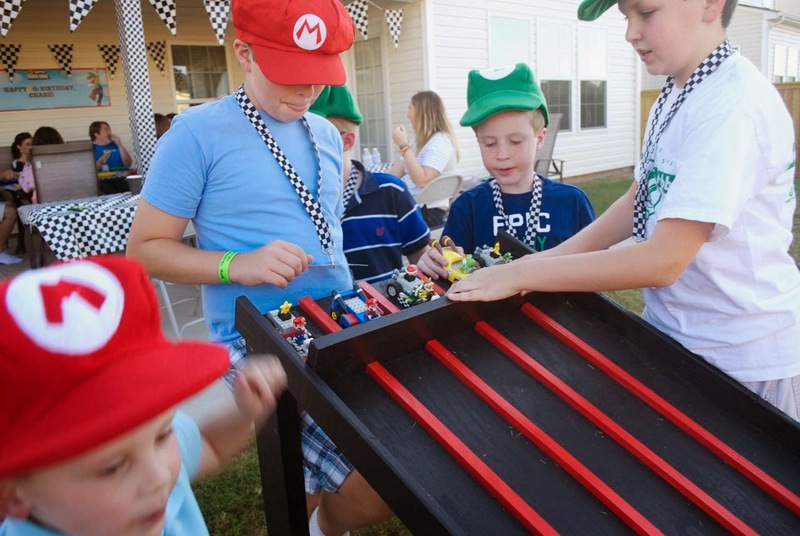 The main activities for the party would be kart building kits that the kids would assemble and then racing said karts outside on a sweet track hubs built. 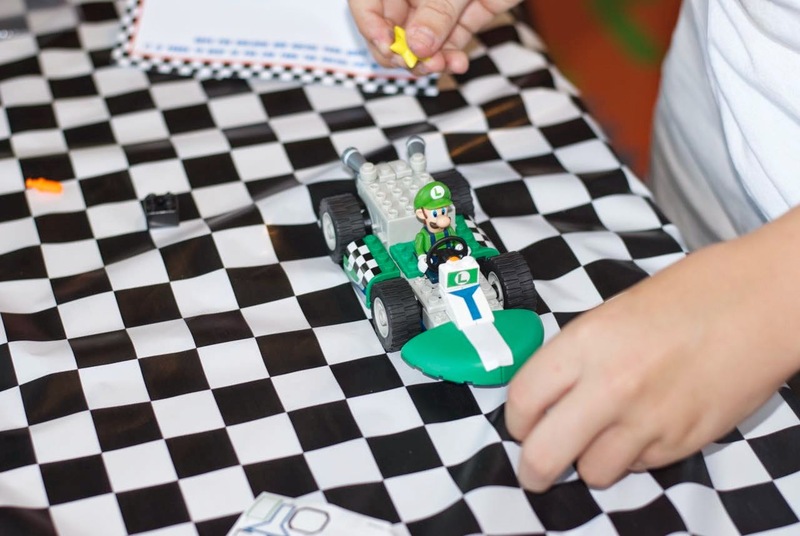 So, to prepare for this, we purchased all of the Mario Kart K'nex Building Sets and I repackaged them into bags with individualized labels matching the party theme (these would also serve as another party favor for the kids to take home). 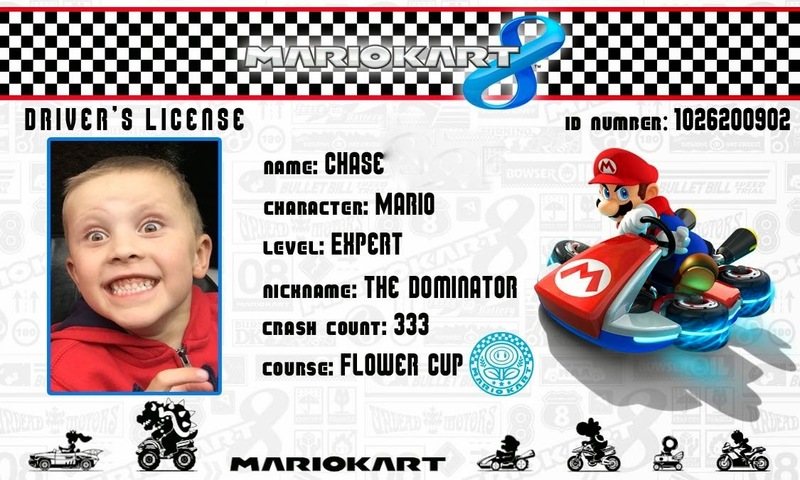 I let Chase decide which of his friends would be each Mario Kart character, so that's how they were assigned (in case anyone wondered). 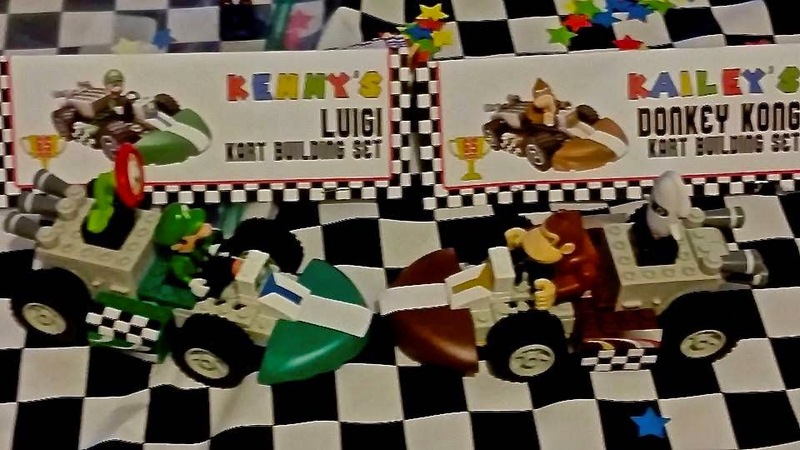 I may or may not have completed several of the first few assembly steps for the younger kids so they wouldn't get frustrated or spend the entire time building the kart and not have any time to race it, especially considering some had around 66 pieces while others had only 24 or so. 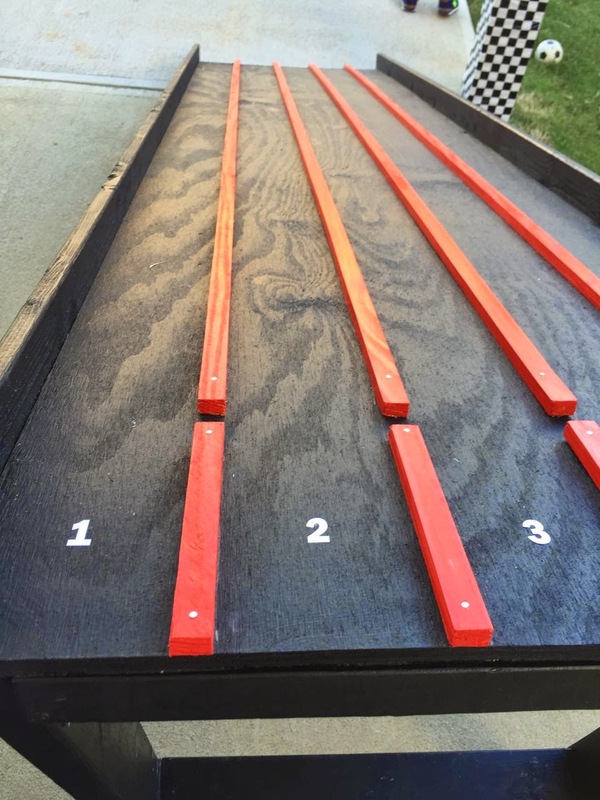 I think several of the kids were excited about it, actually, and they all seemed to have a fun time! 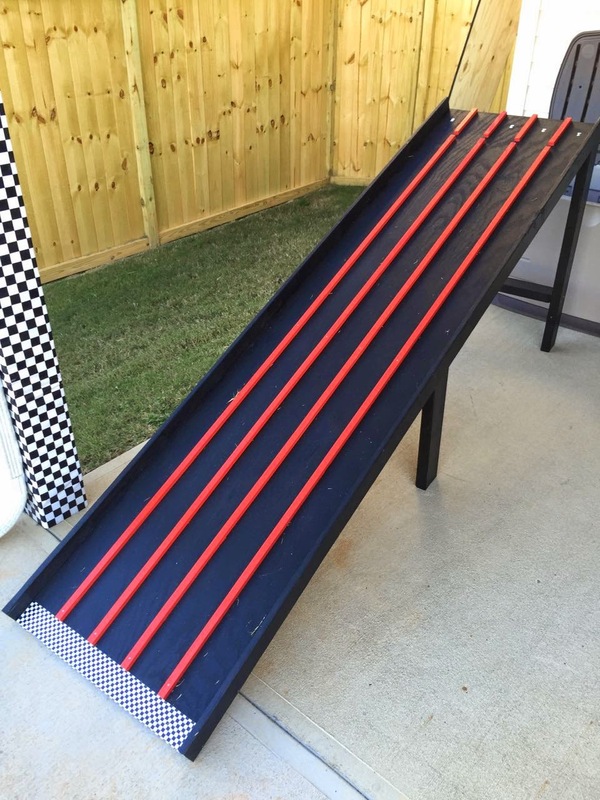 Here's a little look at the ramp hubs made. He did a great job making it to my specifications! The kids helped him paint it, too! 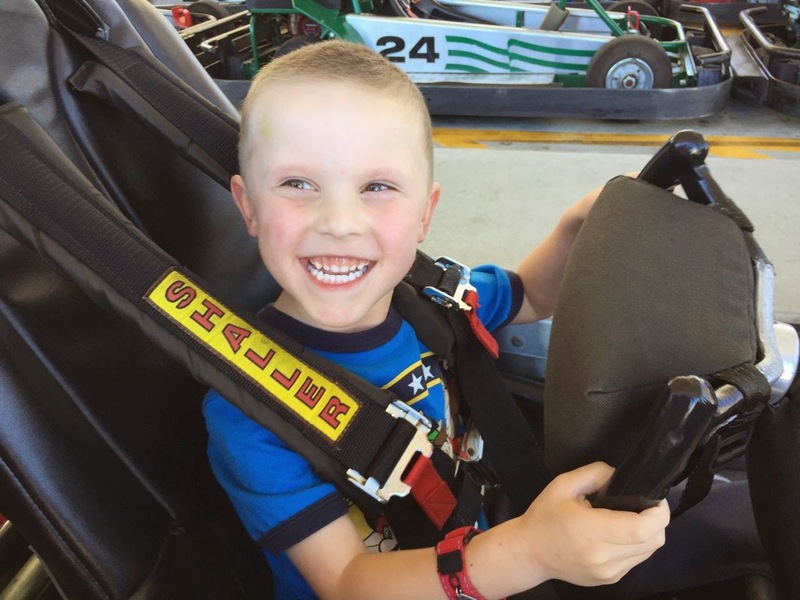 I really think Chase enjoyed the racing activity! 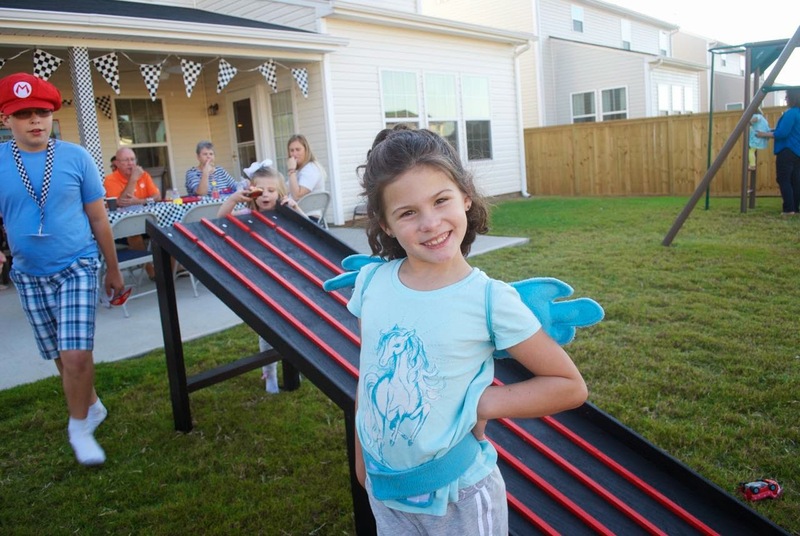 A certain little someone also had a great time -- even if she was part race kart driver and part pegasus. 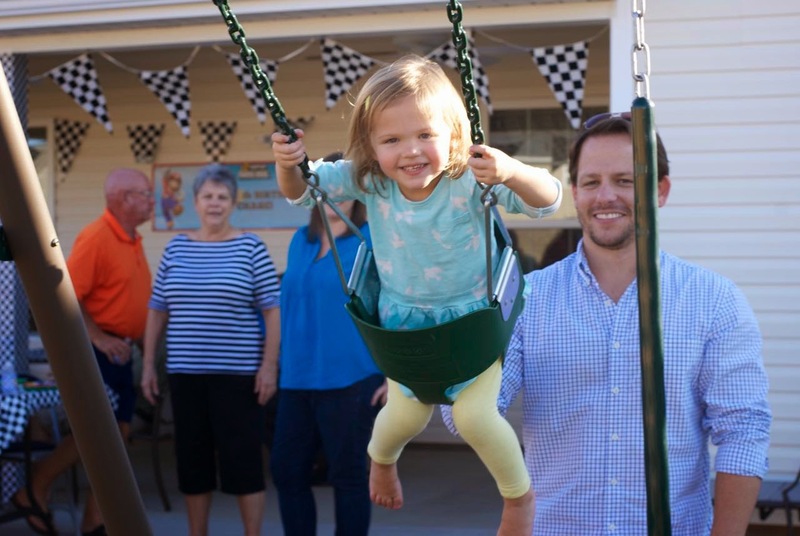 My beautiful niece wasn't as into the racing as she was the swing set! And who could blame her? So sweet! This kid was in heaven! He loved all of the activity outside and the people everywhere! He just strutted around the backyard and did his thing. Next up? The delicious, amazing cake provided to us courtesy of Icing Smiles. 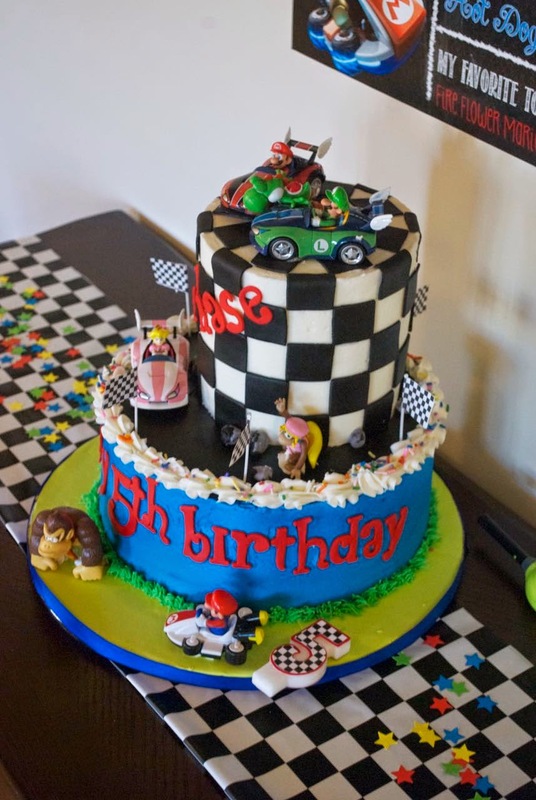 Icing Smiles is a nonprofit organization that provides custom celebration cakes and other treats to families impacted by the critical illness of a child. 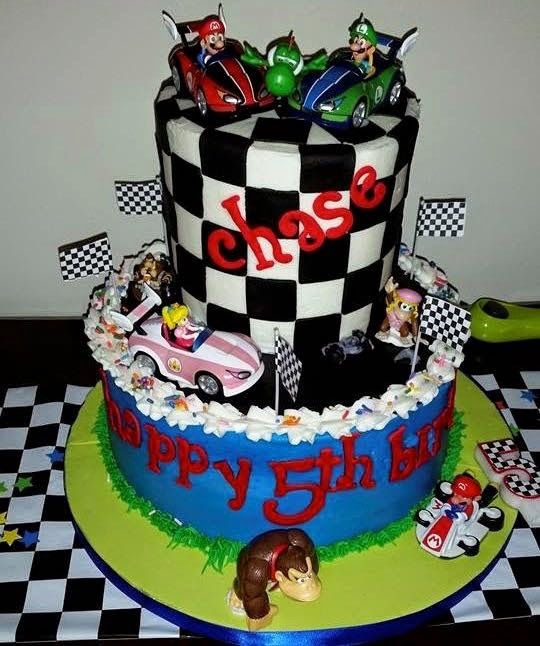 They provide one "Dream Cake" and this one was Chase's. A wonderful baker in our area made this for us and it turned out wonderful! And it tasted great, too! 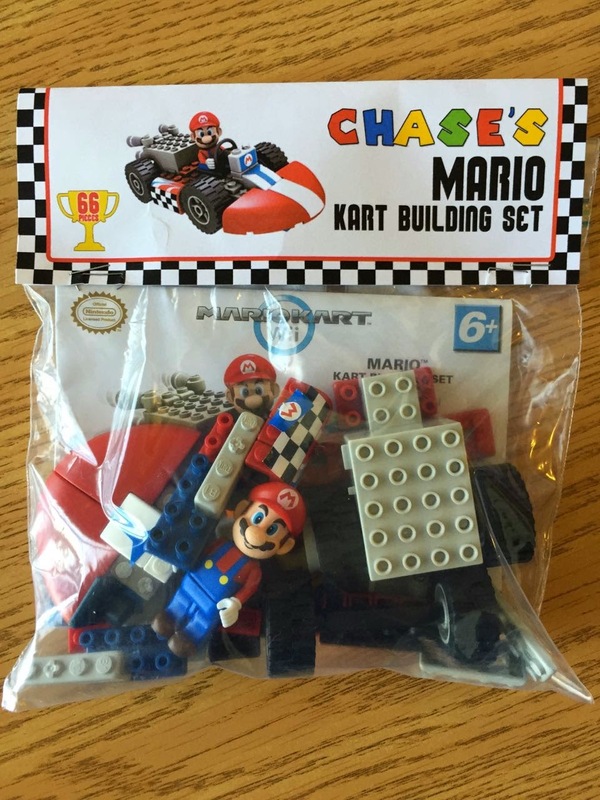 Chase was a huge fan, especially because it had some Mario Kart toys on it he could play with later. Happy Birthday, dear Chase! Make a wish!! 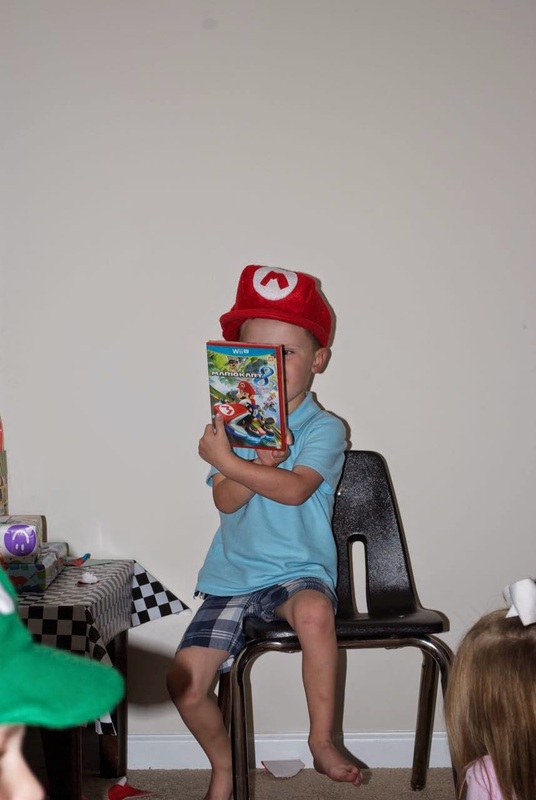 After cake and ice cream, it was time for this guy to open the loot of goodies that were awaiting him. I was a bit worried he'd be reserved and shy with so many people there watching him, but he surprised me and didn't seem to mind being the center of attention! That spot is usually reserved for big sis, but she did a great job of letting him have his day. 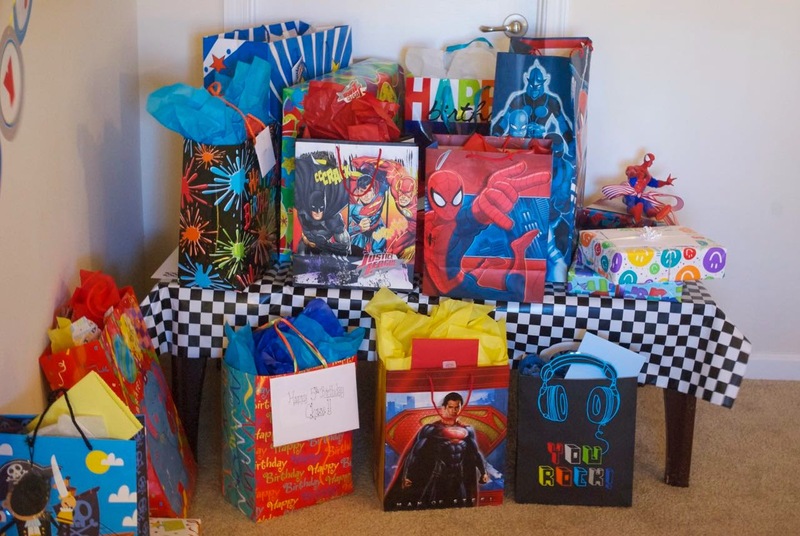 Once the gifts were unwrapped and "Thank You's" were expressed by the birthday boy to our guests, I mentioned to him that daddy and I had one more present for him, but that I thought it was outside. 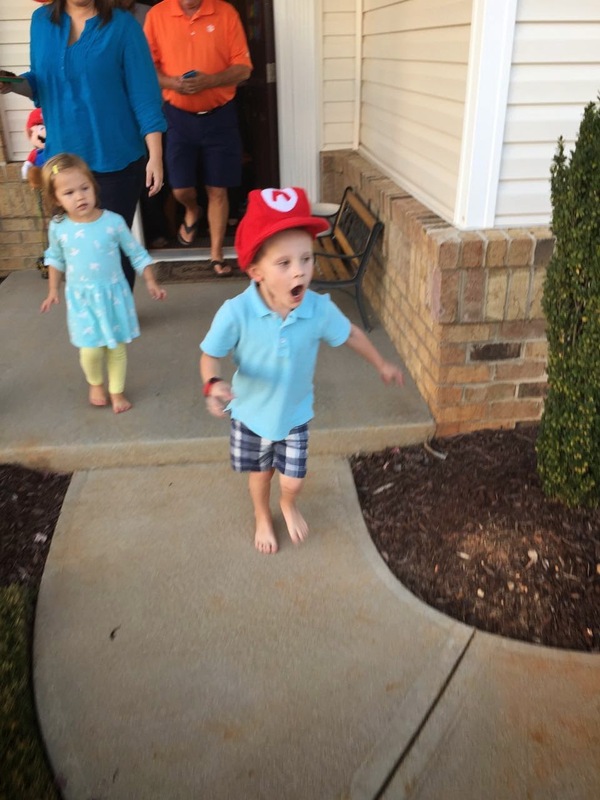 I then led him to the front yard, with our guests following close behind, and caught the greatest face EVER at the very moment he saw what awaited him in the driveway. 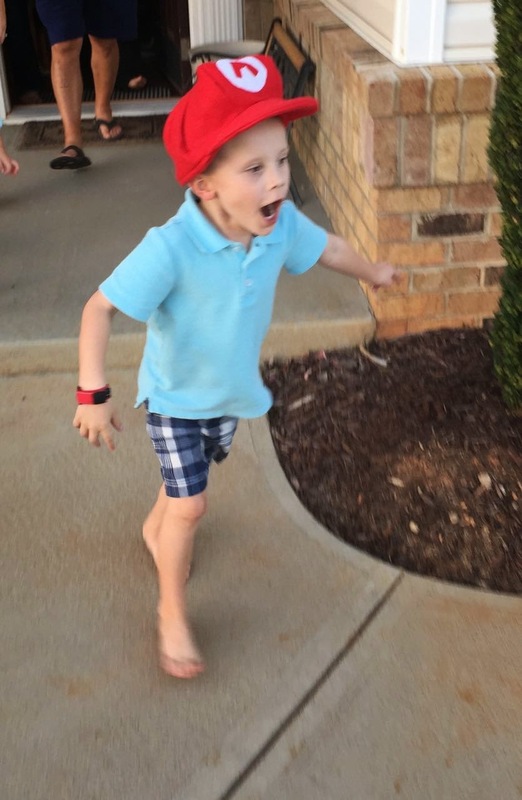 And the look of shock and disbelief only continued to grow as he ran closer and closer to the awaiting gift. It quickly turned into an all-out squealing run! OhMyWord! Can you believe it!? 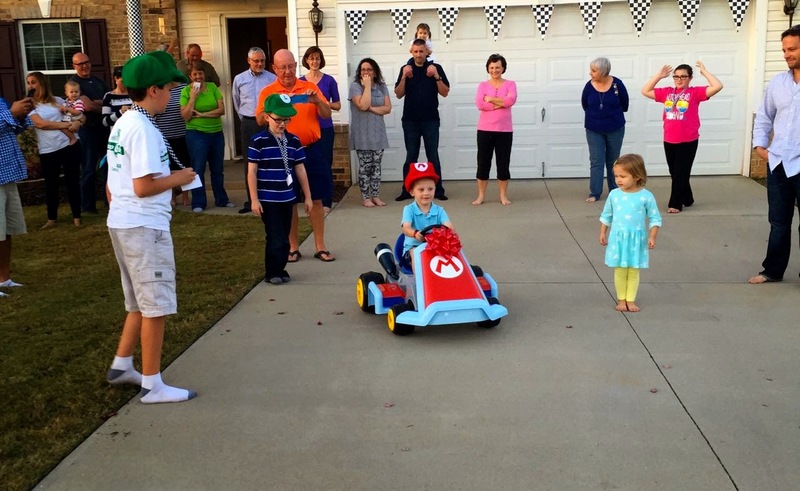 His very own Mario Kart!!!!!!!!!!!!!!!!!!!!!!!!!!!!!!!!!! This kid. He didn't waste any time. He jumped in, threw on the seatbelt and was off before we could say, "Let's Go!" 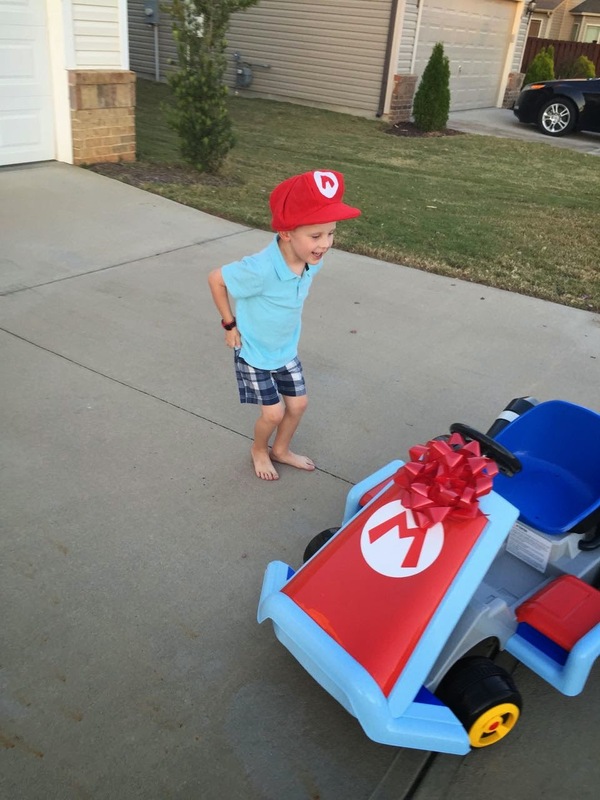 He enjoyed driving it around the street a few times before he came back inside to change. He needed to change. Into what, you ask? 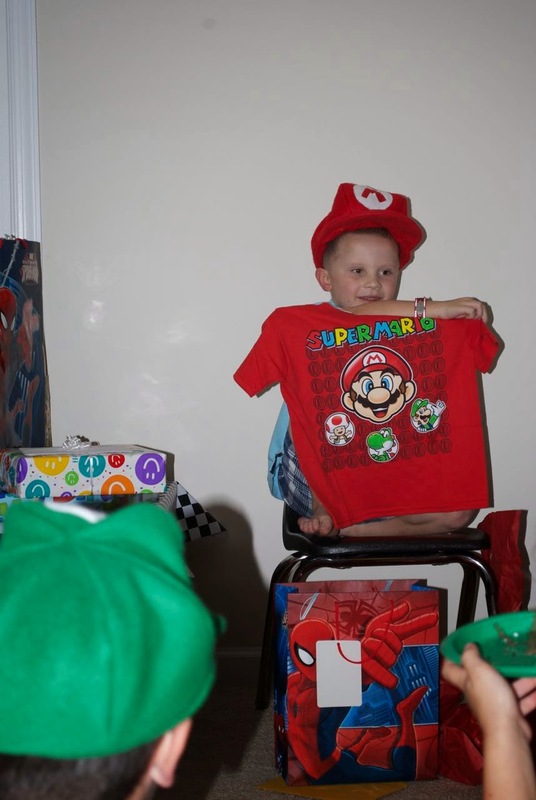 Why, his Mario costume, of course! Have you EVER IN YOUR LIFE seen ANYTHING as ADORABLE as this?!?! I mean, really. I love love love love love this boy!!! 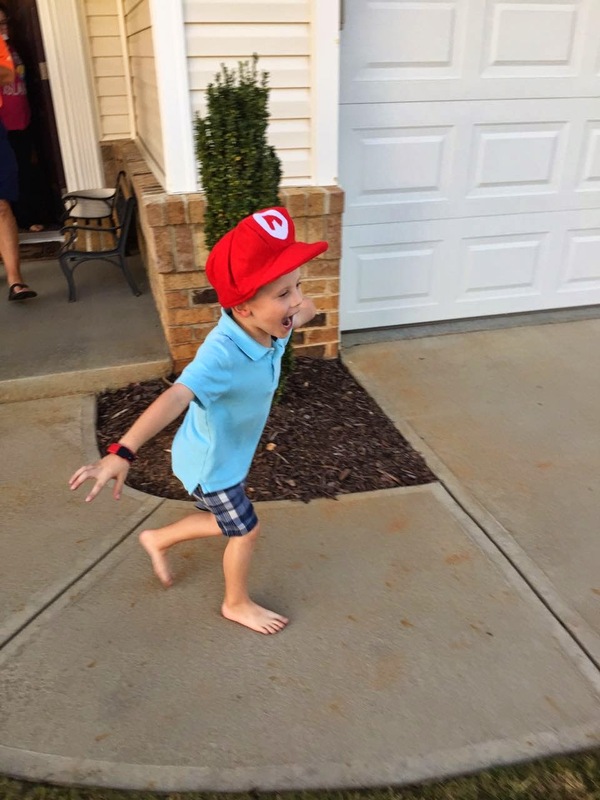 After the excitement of his very own Mario Kart, it was time to head inside and play Mario Kart 8! These kids! 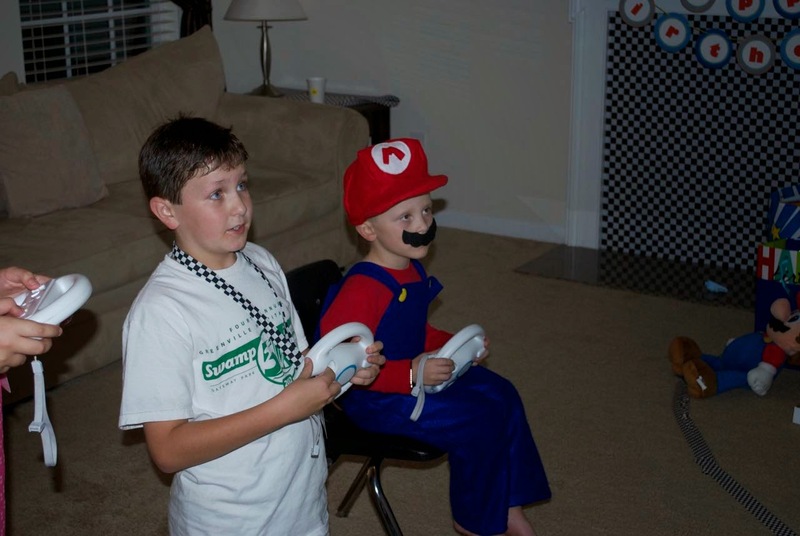 They loved playing Mario Kart, and I find it completely hilarious that Mario himself is playing along. So cute!!! Whew! I know that was a LOT of detail and a LOT of photos, so if you've made it to the end here, thanks a lot for sharing in our special day! We are so proud of the amazing little boy Chase is and could not be more grateful to God for giving us this miracle to love, kiss, hug, squeeze and laugh with every single day! 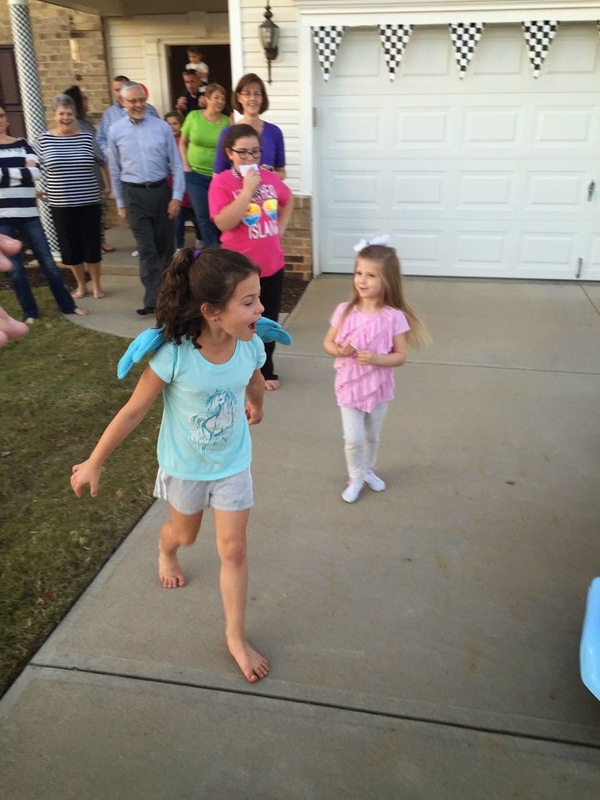 It was definitely a fantastic party for a special five year-old. 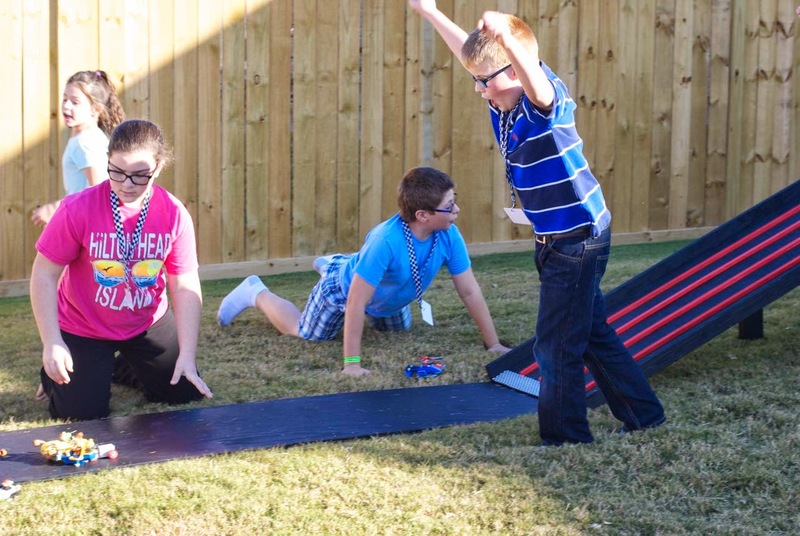 I don't think I can really pick out a favorite part, but the lanyards, race track and cars were pretty awesome. 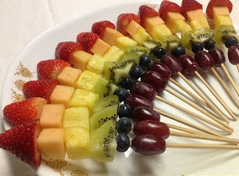 I loved the adult favors and am glad to know where you found the recipe. It was definitely a celebration to remember.